They were level on points with Man City for 1st in the Premier League. On top of that, Bayern, who for the first time appeared mortal, only managed a goalless draw on Friday vs lowly Eintracht Frankfurt! Surely, Arsenal would come out and be poised to take points from Munich and keep their European hopes alive, after their dreadful start. Unfortunately, things did not turn out that way. Bayern, won 5-1 in convincing fashion over an Arsenal side that looked depleted by injuries and demoralized by the end of the game. Credit must be given to Bayern’s superb performance, but lack of squad depth and injuries were just as much of a culprit in this blowout. Let’s look at the injuries in more detail and see how it affected the performance for Wenger’s men. The Gunners were missing Theo Walcott and with him the threat of a speedster who would stretch the defense. While Walcott remains an enigma, he was excellent in the game in London, constantly keeping Alaba and Lahm from supporting the Bayern attacks with his menacing runs. In his place, Olivier Giroud, who was actually Arsenal’s best player on the night, grabbed a goal and held up possession well. Unfortunately, due to his lack of speed and touch, he simply didn’t scare Bayern’s defenders and the wingbacks were free to roam. The excellent David Alaba (whose injury last April was a huge blow to Bayern’s chances in the UCL against Barcelona) was practically playing as an attacking midfielder. I mean, do you think he tries to go for this challenge, if Walcott is playing and ready to counter? The other key injury, was the industrious Welsh midfielder Aaron Ramsey, who suffered a serious injury in the 1st game at the 60 minute mark. With Alex Oxland Chamberlain out as well, Wenger was forced to play Costa Rican, Joel Campbell. The 23 year old, who has been basically loaned out since his arrival to Arsenal in 2011, scored a goal over the weekend, but was miserable in this game. He and Bellerin replacement Debuchy just had no answer for the combination of Alaba and the effervescent Kingsley Coman on the right side. It looked like Campbell lacked experience defending at this level, while Debuchy lacked match fitness, which isn’t surprising, considering he has played 67 minutes in the EPL this season. Again, David Alaba deserves all the credit in the world, as he has in my opinion been perhaps the best left back in the world. One also has to wonder what Juventus were thinking in letting 19 year old dynamo Kingsley Coman join FCB on a 2 year loan, when they could’ve definitely used him. (cough * for Juan Cuadrado* cough). On the left side of the Arsenal lineup, Alexis Sanchez, who was the EPL player of the month for October alternated between lazy defending (as it was pointed out on the broadcast, his failure to back track left LB Monreal 1 v 2 against Douglast Costa and Lahm) and anonymous offense for most of the game. The final blow was Laurent Koscielny, who traveled to Munich for the game but was unable to participate in warm ups and was ruled out for the game. In his place, Gabriel (not best friends with Diego Costa I’m told) was directly to blame for keeping Lewandowski offside for the 1st goal. Bayern’s ability (luck?) to get an early goal off a defensive miscue by Gabriel and Campbell’s laziness allowed them to take the lead. This was always on the cards in the first game, but much like for Guardiola’s Barcelona teams, the goal just never came in the first match, this time it did. Sanchez failed to track back for the 2nd goal, as Lahm and Costa were able to take advantage of Monreal for a 2 v 1, setting up Müller for the finish. The perenially underrated Santi Cazorla, had a poor game and was outmuscled by LEFT BACK Alaba for the 3rd goal. Coquelin, who was imperious in the first game should also share the blame for this goal and for being unable to stop the bleeding. Thiago Alcantara, who scored a 9.8 for this game on http://www.whoscored.com was just everywhere. He set up the 1st goal, and made 2 key defensive interceptions in his own box. He now has 4 assists in 4 games in the UCL. He is also averaging 4 key passes per game with a 92% passing accuracy. The former Barcelona product also leads his team in distance covered with over 41kms, a full two 2kms ahead of teammate David Alaba. Speaking of Alaba, the Austrian LB (who was forced to play as a CB in the first encounter, due to injuries to Benatia and Javi Martinez) picked up a wondergoal and an assist in a masterful display. Show me a better left back in the world! Depth – Bayern were able to bring on superstars like Arjen Robben (that 4th goal was a gem), Arturo Vidal and 27mEuro centerback Mehdi Benatia off the bench. Arsenal brought on Kieran Gibbs, Callum Chambers, and Alex Iwobi, who is supposedly Jay Jay Okocha’s cousin. 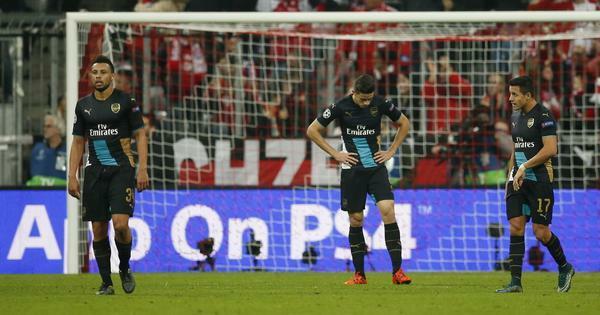 In the end, it was a masterclass by Bayern, outshooting Arsenal 23 to 7 while dominating possession 66% to 34. While Arsenal made the trip to Munich with a depleted squad, they left with a thrashing and their proverbial tail between their legs. There are 2 matches remaining for the Gunners (11/24 home vs Zagreb and 12/9 away to Olympiacos), who now sit bottom of the group with 3 points, (Bayern are obviously 1st with 9) and it’s increasingly more likely that Wenger’s men will end up not progressing. With the recent injuries to Walcott, Oxlade-Chamberlain, Bellerin, Koscielny, as well as Wilshere, Rosicky, Ramsey and Danny Welbeck not expected to be fit before the new year, it’s perhaps a decent idea to sacrifice Europe for a run at the EPL title. While no team can control injuries, spending money during the transfer window to increase squad depth would have been a very reasonable decision, and one for which Arsene Wenger should be criticized heavily. Gunner fans can take solace in beating Tottenham this weekeend, which would presumably make them forget about the lesson they were taught in Munich. While there is no shame in losing to the consensus best team in the world (as of right now), Wenger should learn his lesson and spend freely in January, if they are to win the title.